North Korean defector Ji Seong-ho speaks to reporters in the press briefing room at the White House in Washington, Jan. 31, 2018. Ji was a guest of President Donald Trump when he delivered the State of the Union address. A North Korean double amputee who fled North Korea on crutches says President Donald Trump sent a warning when he spoke of human rights violations in North Korea. During Tuesday night's State of the Union address, Trump said, "No regime has oppressed its own citizens more totally or brutally than the cruel dictatorship in North Korea. ... We need only look at the depraved character of the North Korean regime to understand the nature of the nuclear threat it could pose to America and our allies." That Trump's speech recognized human rights violations in North Korea, using Ji Seong-ho as an example, "will be meaningful to the people of North Korea," Ji said. "It probably will come as a big threat to the North Korean regime." 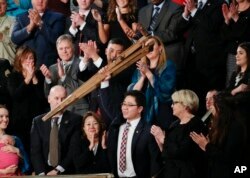 Ji, who waved a pair of wooden crutches as Trump acknowledged him, said he was "deeply moved" and "honored" to be mentioned by the president in his first State of the Union address and applauded by lawmakers. Ji Seong-ho holds up his crutches after being acknowledged by President Donald Trump during Trump's address to a joint session of Congress on Capitol Hill in Washington, Jan. 30, 2018. "I was moved to tears," Ji told VOA's Korean service. "I have never felt more honored in my life." Trump used Ji's story to describe "the depraved character" of North Korea when he said the reclusive nation's leader, Kim Jong Un, "recklessly" pursues the development of nuclear weapons and missiles that "could very soon threaten [the U.S.] homeland." Instead of condemning North Korea as he has in past remarks and tweets, Trump highlighted Ji's escape from hopelessness and hunger. Like many North Koreans, Ji suffered in North Korea's famine of 1995-98. Triggered by a series of natural disasters and the disintegration of the country's economic policies after the collapse of the Soviet bloc eliminated key support, the famine led to as many as 3 million deaths. Many of the victims were urban residents unable to forage for sustenance. In 1996, the teenage Ji watched his body swell after he ate grass and dirt. Then, "my wish was to eat just a few ears of corn, not even a bowl of white rice. My biggest wish until I defected from North Korea was to cook an entire chicken and gorge on it," Ji told VOA in 2017. At the time, Ji "was helping my parents make a living by stealing coal off trains and selling it in the market. I got dizzy once and I ended up falling off a moving train. It ran me over." His left arm and leg were amputated in North Korea without anesthesia. 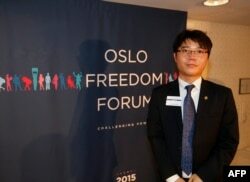 FILE - Ji Seong-ho, North Korean refugee and president of Now Action and Unity for Human Rights, is pictured during a press conference on May 25, 2015, in Oslo, on the eve of the Oslo Freedom Forum. On crutches, Ji crossed into China to find food. But upon his return, he was caught by North Korean guards, "who told me that because I am disabled I brought shame to North Korea and that someone with only one leg should stay home. That is when I lost my trust in the North Korean government," he told VOA last year. Ji fled North Korea in 2006 by crossing the Tumen River into China and making his way to Laos and Myanmar, before entering Thailand. From there, he was transported to South Korea where he received a prosthetic arm and leg. Ji kept his crutches, which he lifted up before lawmakers Tuesday night. "These crutches symbolize that I have found freedom and that I am living a new life. … They are the message that I am sending to Kim Jong Un and Kim Jong Un's regime," Ji said. Today, Ji runs Seoul's Now Action and Unity for Human Rights (NAUH), an organization that helps defecting North Koreans by coordinating their journeys into South Korea while preparing for unification. According to the South Korea's Unification Ministry, 31,339 North Korean defectors entered South Korea between 1998 and 2017. As a human rights activist, Ji wants to see Trump pressure North Korea on human rights. He's concerned about China's crackdown on North Korean defectors. If given the chance to speak with Trump, Ji says, he would discuss how to stop Beijing from returning defectors to North Korea. "Although I am a disabled person, I've become someone the U.S. president recognizes. This became possible because I came out [of North Korea] to seek freedom," Ji told VOA. "I want to see the day when many people come out of North Korea to find freedom, and I want to see democracy rising up inside North Korea to overturn the regime." Christy Lee contributed to this report, which originated on VOA's Korean service.